Feeling like you’re a little in the dark when it comes to your own family? Has communication dwindled between you and your children? Then it’s time to hold a family meeting, either as a one-time event to discuss important family matters or as the beginning of a regular routine. Sure, it might seem a little cheesy—like something you might see in a made-for-TV movie—but you’d be surprised at what a difference it can make for your clan. Although you might eat dinner together as a family or you may all sit around the family room watching TV, your conversation may be more lighthearted and everyone may be a bit distracted. A family meeting is an opportunity to accomplish something specific without any distractions from the outside world. Communicate logistical issues. If you have a busy family, a weekly meeting could be the best way to coordinate schedules. Use a family meeting to review sports practice schedules, transportation issues, and other activities. Deal with a specific problem. Perhaps you need to problem-solve an issue, like the living room always seems to be a mess. Or maybe, you’ve noticed that everyone is using their electronics too much and the family seems distanced. A family meeting can be a great way to brainstorm your options and create a plan to work together to resolve it. Gather input about a potential change. If you’re thinking about making a big change that could affect the family—like a move to a new city or a change in your work schedule—a meeting can give you an opportunity to talk about it. Make it clear that the decision is ultimately up to the adults, but you’re interested in hearing how your children feel about it. Assess how everyone is doing. If the family has dealt with a tough issue, like the loss of a pet or a health issue in the family, a meeting can be a helpful way for everyone to check-in and talk about how everyone is doing. Make transitions smoother. If you're going through some changes, like blending a family together after remarriage or adjusting to a new baby in the home, a family meeting can be an opportunity to help everyone adjust. Putting your heads together can help everyone know you're all in this together and it can help kids feel supported. Building children’s self-esteem. Family meetings give children a voice, ensuring that they know they are a valued member of the group. It also shows them that their ideas are considered, rather than ignored, which can be good for their self-esteem. Teaching kids how to appropriately manage social situations. Family meetings might work on solving a disagreement, showing kids and teens how to compromise, express feelings, and resolve the problem amicably. Reinforcing the family’s values. There’s not always time in daily life to reaffirm the values that you want your children to espouse. With family meetings, though, you can talk about specific topics that teach a lesson you want your children to understand. You may explain the values that drove you to make a certain decision, like changing jobs or beginning volunteer work. Sharing information. Meetings give you the ability to share information with the whole family at one time, so no one is left out from knowing and understanding what’s going on, whether it’s with a parent’s job, a family pet, a member of the extended family or an academic situation. Celebrating everyone’s achievements. Whether you’re publicly acknowledging a child who was especially helpful over the week or you want to announce you got a promotion, a family meeting can be a great way to celebrate one another’s accomplishments. Everyone who lives in the home should be encouraged to join the family meeting. That includes not only the nuclear family—parents and children—but also any relatives that live in the house, such as cousins or grandparents. Be prepared to lead the discussion. If you have older children, though, consider rotating through each person serving as the leader of the meeting. This continues to show them that they’re important members of the family, who can play a valuable role. Additionally, everyone at the meeting should get some time to talk. Some people might not want open up, but gentle questioning—such as asking them about the best thing that happened to them that day—might help start the conversation. Meetings don’t need to be especially formal so don’t feel as though you need to follow Robert’s Rule of Order and get your ideas seconded. But, you may want to create some simple rules for your meetings. “Only one person talks at a time,” or “No electronics use during meetings,” may ensure everyone stays respectful. You can use your first meeting to brainstorm a few simple rules that everyone agrees upon. If your kids are especially chatty or they have trouble waiting their turn to talk, you may want to create a fun way to remind them that only one person talks at a time. Use a “talking stick” or a ball to indicate that it’s your turn to talk. When you’re done speaking, you pass the object to someone else and it signifies that it’s the other person’s turn to speak. You might even create an agenda ahead of time. Keep a piece of paper on the refrigerator and let anyone add topics they’d like to discuss at your next meeting at any time. When it comes to the location of your family meetings, you have a couple options: You could hold it at a regular time, such as once a week after dinner while everyone is enjoying dessert, or you could switch up the location with every meeting. Why switch the location, rather than holding it at home every time? For regular family meetings to be successful, they shouldn’t be a dreaded experience. Making it a special outing for the kids—say, going out to ice cream or taking a picnic to the park—will help boost participation and decrease potential complaints. Pick a day of the week that has the fewest conflicts with the family’s schedule, and make it a priority. 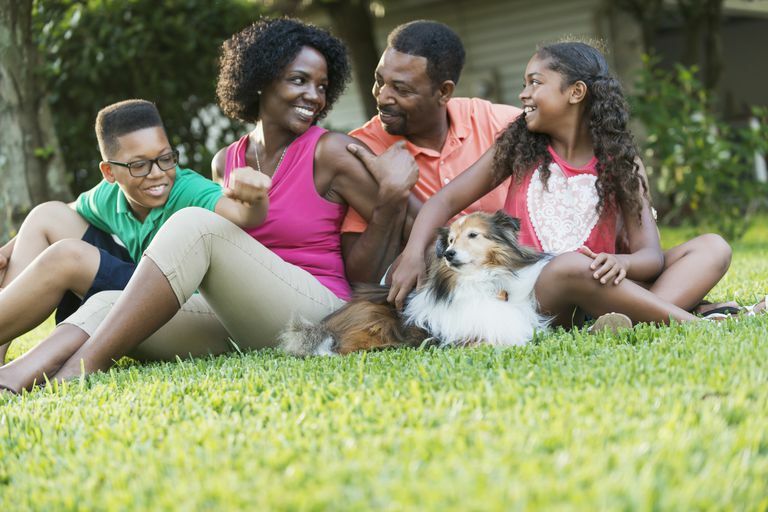 While the day of a week might change as responsibilities and hobbies in school, work, and extracurricular activities morph, the family meeting shouldn’t be something you just “fit in” whenever you can. One-off family meetings will likely take as long as necessary to resolve the issue that prompted the gathering. For regular meetings, though, stick to 20 to 30 minutes, unless someone in the family asks to continue the conversation. When you’re holding routine meetings, the goal is to check in quickly with everyone, not make everyone sit together for the whole evening. You might reserve one meeting a month for a longer time period, and then table issues that need more complex conversation until that particular meeting. End each meeting by asking each family member how they felt about the meeting, and what could be done better next time. You could also finish it up with a fun experience, like watching a TV show together or playing a board game. This will encourage everyone to participate and remain in a good mood until the end because there’s something to look forward to. When you first implement family meetings, you might receive a little bit of pushback from spouses or children who don’t think it’s a necessary use of their time. When they’re held successfully, though, all the family members will quickly realize what a valuable tool they are for family togetherness. Giving up too soon. If your first meeting doesn’t go well, don’t give up. It may take some time for everyone to grow comfortable with family meetings. But if you hold them regularly, and you strive to make them better, your meetings can become helpful to everyone in the family. Letting kids have too much power. While you want to use meetings to elicit the kids’ opinions, make it clear that they don’t get an equal vote on major family issues, like whether you’re going to move or if you’re going to get a new puppy. Let them know that the adults will ultimately make the decisions but you are interested in hearing their thoughts on the matter. Turning a meeting into a lecture. Don’t use your meetings to single one person out for creating a problem and don’t lecture the kids about not picking up after themselves. You might take a problem-solving approach by saying, “The house has been pretty messy lately. What can we do about that?” and tackle the issue together. Going too far off topic. Your kids may begin to stray off topic and if you don’t bring the conversation back to the task-at-hand, you may feel like the meetings don’t accomplish much or that they last too long. So if the conversation veers off-topic too much, step in and remind everyone you’ll have plenty of time to hear funny stories or talk about extra issues after the meeting. Getting into arguments. The last thing you want is for a family meeting to turn into a heated argument. Family meetings are a great time to introduce socially appropriate ways to deal with disagreements. So step in if the kids start to squabble or give a consequence if someone hurls insults or crosses the line. How to Have a Family Meeting. HealthyChildren.org. Published November 21, 2015. Matejevic M, Todorovic J, Jovanovic AD. Patterns of Family Functioning and Dimensions of Parenting Style. Procedia - Social and Behavioral Sciences. 2014;141:431-437.